Just think of all the things you can do with a rubber snake. They make great decorations during Halloween and for haunted houses or you can use them as a gag to give one of your friends a scare. 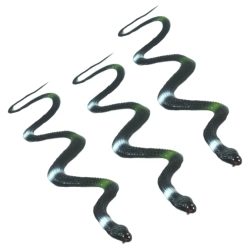 The small rubber snakes has realistic coloring so colors may vary, measures 14” long, and comes in a pack of 3.